I'm December and my blog is http://takosan.pl/ (please forgive me my mistakes, as English's not my native language). I'm really greatful to Susan for inviting me here. I read the posts of the previous guests and I must say I am in an excellent group. Thank you so much! When Susan wrote me on Ravelry, I was dumbstrack. 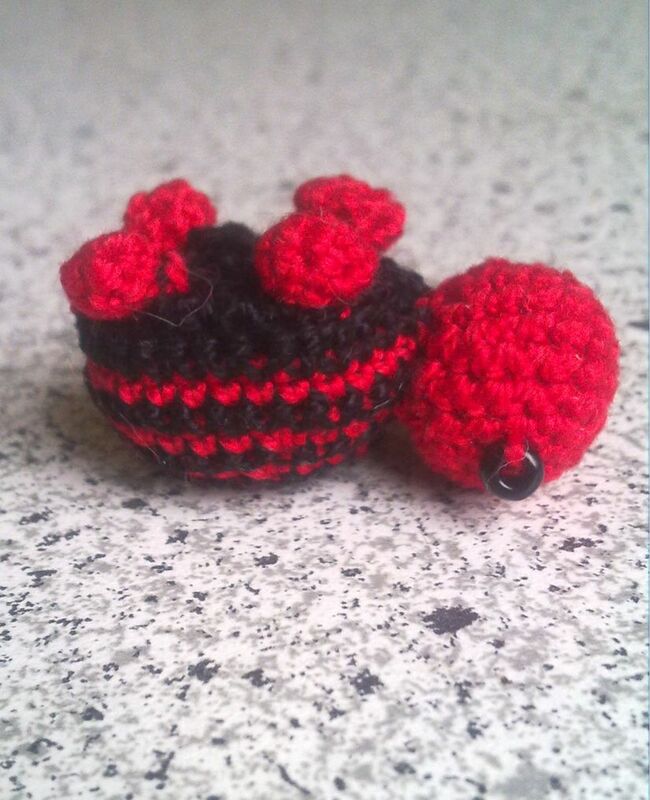 I don't think of myself as a skilled crocheter. But I took the challenge and – here I am! 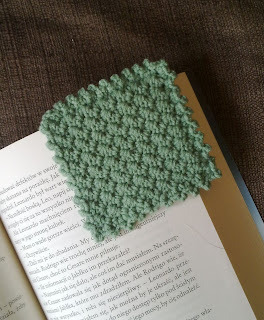 With the pattern for a corner bookmark. Hope you'll like it! It was made with Alize Puffy Season and 3,5 mm hook, but you can use whatever yarn you like (and hook that matches it). You'll need small amount of yarn (maybe some leftovers?) and yarn needle. 1. I started with making ch 16, but you can make your bookmarks smaller or larger – but remember that the number of chains must be even. 2. Make ch 3 and 1 dc in 3rd chain from hook. Then repeat: *skip 1 st, sc and dc in next st*. In the last st make 1 sc. 3. Ch 2, turn, dc in the same st, then repeat: *skip 1 st, sc and dc in next st*, in the last st make 1 sc. Now repeat 3rd row until you get a square (in my case it was 11 rows more, but it depends on size, your unique crocheting style and yarn). 1. Put both pieces together and use yarn needle to keep it on place. Start working on the corner where you've finished second part. Join pieces at the lenght of two sides of square, repeating: *sc in next 2 sts, ch 2, sl-st in the 2nd ch from hook*. In the corner stitch you need to make 3 sts. 2. When you reach 3rd side of square, stop joining pieces and just continue on one of them. FO. Later you can end crocheting around the second piece or not – it depends on you. Weave in all threads. Thank you for your attention. I'm really glad to be here! Susan is so amazing person, I hope things will get better for her soon! In the meantime, I'm sending you much of love, Sue! Thank you ever so much December! 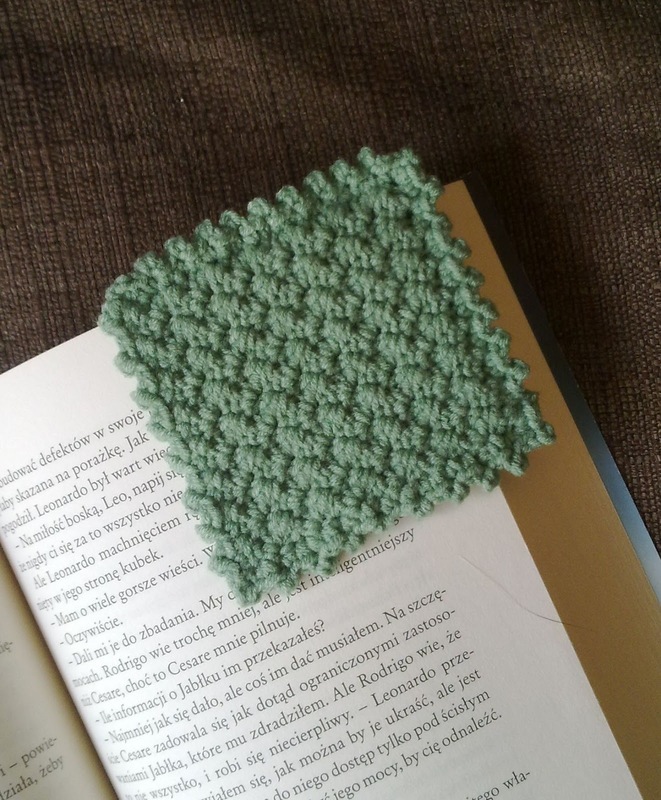 Thanks ever so much for the bookmark pattern! I hope you all enjoy her fantastic post & fantastic pattern. Glad you like it. I have forwarded your wonderful comments to December. This bookmark will make great Christmas gifts!! Thanks!! I have forwarded your wonderful comment to December.